That’s one heck of a resume if you ask me. What guard dog could possibly hold such a distinction? Meet the Boerboel, also known as the South African Mastiff or African Boerboel. This Molosser breed from South Africa knows how to hang with the animals of the wild. With genes that make it the ultimate protector, its strength and intelligence should never be underestimated. But, it loves family- especially children, making it a gentle giant that will protect its family under any circumstances. What is a Boerboel Dog? What Does the Boerboel Look Like? Does the Boerboel do Well Around Children? How Long is the Lifespan of a Boerboel? How Much for a Boerboel Puppy? Do You Want to Rescue a Boerboel? 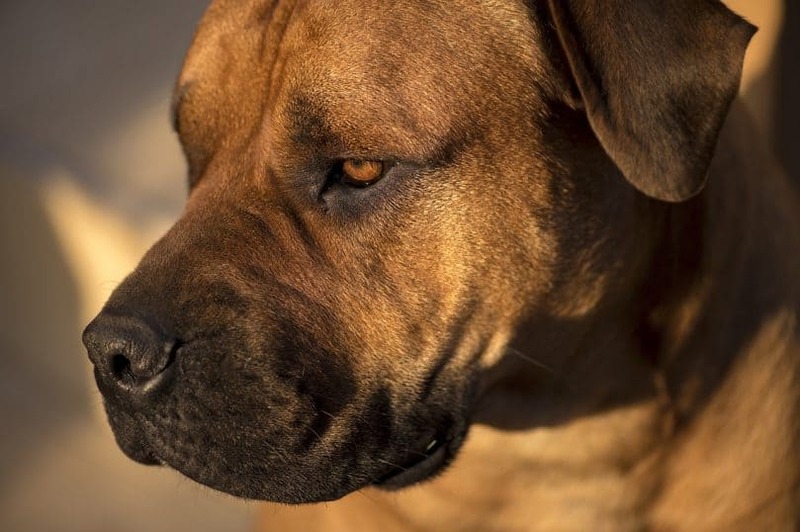 Conclusion: Is the Boerboel the Dog for You? Pronounced “boo-r-bull” this breed finds its roots in South Africa, where the first farmer’s dog was believed to have been brought over by Jan van Riebeeck in 1652. Years of breeding fine-tuned the purebred the Boerboel dog is today, but its exact lineage is mostly unknown. It is, however, thought that African landrace dogs, such as the Africanis, play a role in its original genetic makeup. In the 1800s, a number of dog breeds were brought to South Africa to help guard the military posts found scattered throughout the territory. This included Mastiffs, Bulldogs, Greyhounds, Terriers, Pointers, and Bloodhounds, which ultimately contributed to the final product (especially the Mastiff and Bulldog): the Boerboel. This cross was known as the best of the best for guarding against large-scale predators such as lions, hyenas, baboons, and leopards. It is not believed that typically a Boerboel can kill a lion or leopard though. 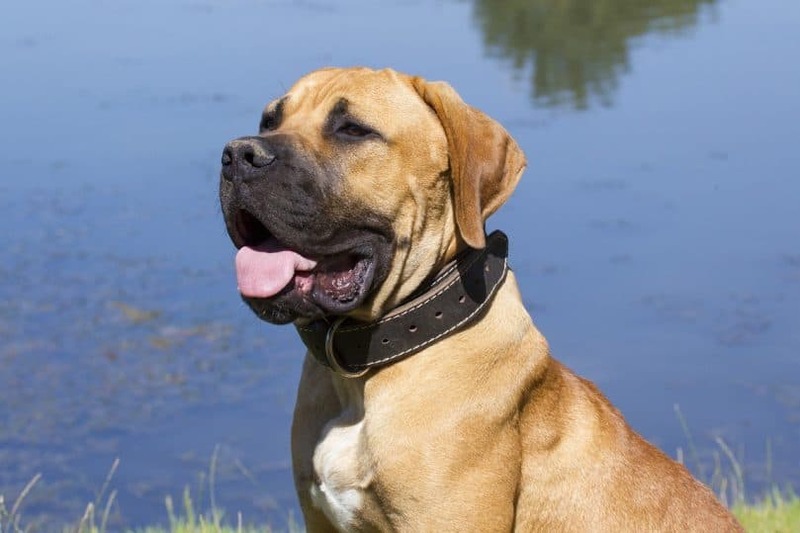 Boerboels quickly became the dog of choice to defend homesteads, while retaining a loyal and loving disposition, which makes them impeccable family dogs. The Boerboel stands up to 28 inches (71 cm) tall and can weigh up to 200 lbs (90 kg). This breed is all muscle and brawn, with a strong bone structure, and a large head accompanied by impressive jowls. You won’t have to worry about much shedding, as its short coat is smooth and dense. This makes them easy to groom, and they only require occasional brushing. The standard breed sports a coat that can be a number of shades, including fawn, red, black, brown and brindle. There can be white markings around the neck, face, and paws. But, if the coat is more than 30% white, then it’s considered a fault. Pay attention to the coat color. If this dog has a black coat, it will not be recognized by The Kennel Union of Southern Africa (KUSA), AKC, BI or Ebbasa. But, it will be accepted by the SA Boerboel Breeders Association (SABT/SABBA). This is a watchdog you won’t be disappointed with, especially if you live in a rural area and have farm animals that need protection from large predators, such as say, wolves or bears. The Boerboel displays protective characteristics and is highly territorial. But, when it comes to its family, children and family pets, it’s as sweet as can be, gentle and loyal. The important factor to remember is that this dog needs ample training as a puppy. Without it, destruction and aggression can develop. Honestly, this is a dog that requires time and dedication. Therefore, it is not a recommended breed for first-time dog owners. This is a big dog that needs big space. A tiny apartment isn’t going to cut it. Remember, its ancestors would roam the African plains protecting the homesteads. This is an outdoors farm dog at heart. This breed doesn’t like to be left alone for too long. Separation anxiety and boredom set in, and in turn, you can expect destructive behavior. Watchdogs are dominant in nature. A trainer needs to be assertive, confident and patient, utilizing positive reinforcement to set boundaries and develop obedience. Socialization is highly important for this breed to adjust to getting along with other dogs. Check out how well-behaved this Boerboel puppy is during training! This is a hearty breed, gleaned from decades spent outdoors in harsh African climates. The life expectancy of a Boerboel is 10 to 12 years. There are some health issues common among these dogs. Heart disease: This deadly condition of the heart can be caused by valvular disease, heartworm, and myocardial disease. Ectropion (eyelids sag outward): Can cause eye dryness, tearing or irritation. Entropion (eyelids roll inward): This results in eye irritation. Vaginal hyperplasia: A mass that protrudes from the vaginal area and can cause extreme discomfort. When you shop around for a Boerboel puppy, be sure to inquire about certain health clearances for reassurance. Reputable breeders should offer the following: Orthopedic Foundation for Animals (OFA) evaluation for elbow health, OFA or PennHIP test for hip health, eye exam and an OFA evaluation/echocardiogram for heart health. This big boy is going to need a fulfilling diet that is readily adjusted as it grows from puppy to adult. Include high-quality dry feed and consult your veterinarian for portion control. As long as the Boerboel gets the exercise it needs, it’ll stay healthy and muscular. 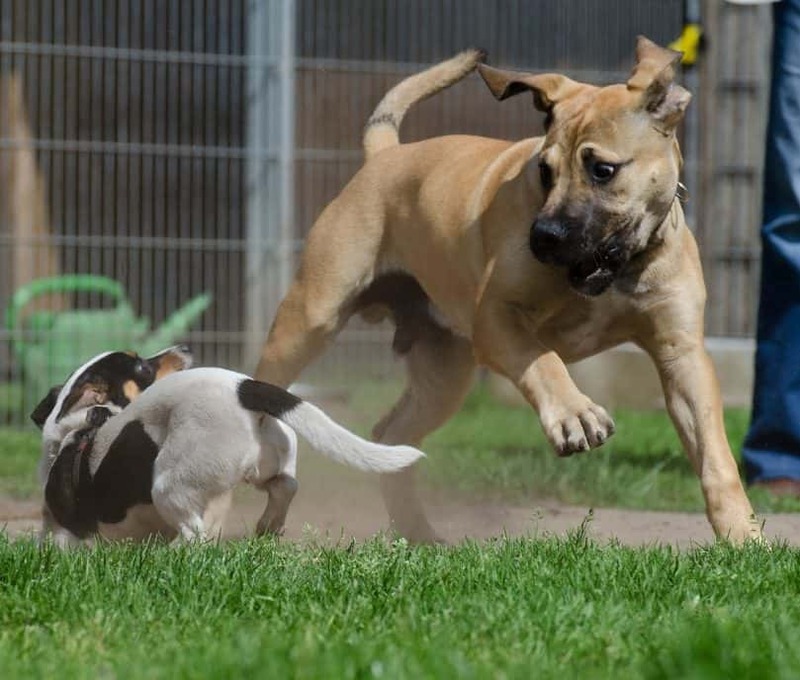 Of all the Mastiff-type dogs, the Boerboel stands apart with its superb agility and energy. It’s also sharp and intelligent, never missing a beat. We recommend an environment that allows this breed to get plenty of activity time each day that is both physically and mentally stimulating. That means considering a fenced in yard that allows her to stretch those legs, long walks around the neighborhood or play sessions, such as with a ball. Challenge your Boerboel with a puzzle feeder to keep that brain working. 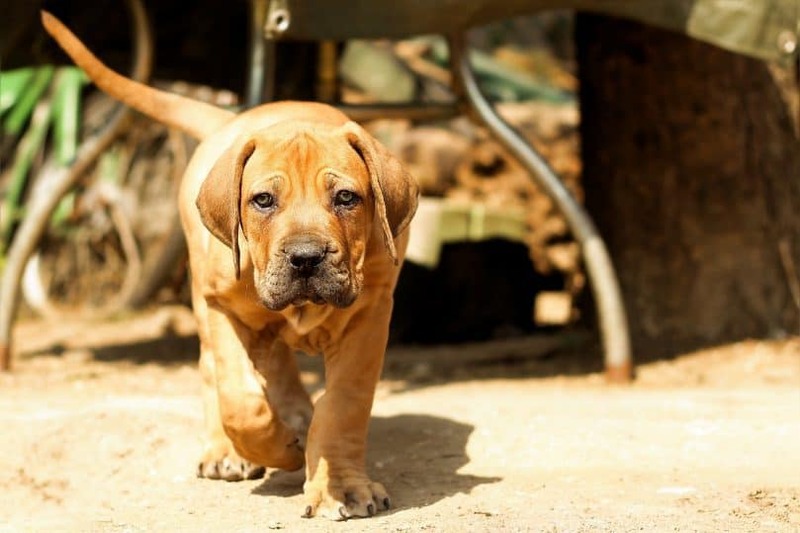 There are several factors when it comes to the price of a South African Boerboel puppy, such as the lineage, supply/demand, litter size and breeder reputation. On average, a puppy from a good breeder with papers will cost around $1,500. A puppy without papers can be cheaper, but we do not recommend purchasing puppies without the necessary health documentation. With AKC registration good to go, there are numerous Boerboel breeders found around the United States. Finding them isn’t the hard part, though. It’s being knowledgeable about how to choose an ethical breeder. It seems as if nowadays anyone can breed dogs for a quick buck. Health is a factor that is incredibly dire to consider, and a good breeder will put this at the forefront of any sale. Research Boerboel breeders carefully and speak with them over the phone first before going to visit. Yes, visiting the puppies home is a must. Not only do you get to scope out where the puppies were born, but you can evaluate the conditions and perhaps meet the parents. A good breeder will welcome you to the breeding premises and will be ready to answer any questions you may have. Your questions should center on the parents. What is their health background? Are health clearances available? What is the procedure for spay/neuter? In turn, the breeder should be curious about your legitimacy as a dog owner, especially for a specialized breed like the Boerboel. They’ll ask you questions to ensure their puppies are going to homes that are suitable, with people that have the time and financial means to give their Boerboel the best environment. Take your dog search to the next level by adopting a Boerboel! All dogs need love, even the big and seemingly intimidating ones. When you rescue a Boerboel, you’re giving her a chance at a fresh start with a loving family that she will recognize and never forget. You’ll have one loyal protector that will always make you feel appreciated and safe! U.S.A. Boerboels In Need: This Facebook page features up-to-date posts on Boerboels across the nation that are looking for their forever homes. Trying to get a clear mental picture of what the Boerboel has to offer? Let’s match them up to a few similar breeds and see how they compare. This is a Bulldog and Mastiff cross originating from England. The Bullmastiff is also a large dog, although a bit smaller than the Boerboel, weighing up to 130 lbs (58 kg). Bullmastiffs were also brought to South Africa in 1928 by the diamond mining company De Beers. They were used as guard dogs and proved to adapt well to the environment, protecting the mines in the wild African lands. Comparing the two breeds, they look a bit similar, although the Boerboel’s face is less wrinkled and not as large as the Bullmastiff. The Boerboel does owe much of its genetics to this mix, though. The Bullmastiff is also an excellent guard dog but makes a wonderful family dog if it receives the proper training. Also known as the Italian Mastiff, this is another Molosser dog that boasts a reputation for being a magnificent companion dog, hunter, and protector. Sleeker and less bulky in build than the Boerboel, this large dog can weigh up to 110 lbs (49 kg). It is a direct descendant of the ancient Canis pugnax, which was utilized by the Romans during battles of war. 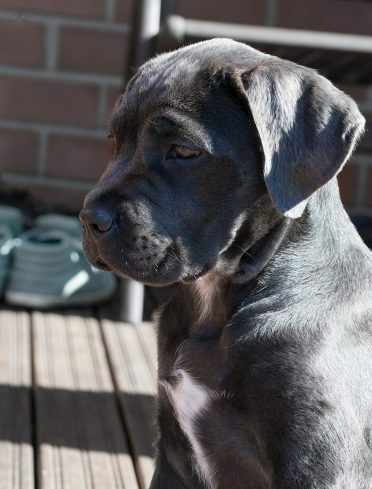 Those pure bloodlines establish the Cane Corso as an adept catch dog. It works well out in the fields with livestock, and to hunt wild boars. Like the Boerboel, the Cane Corso is more athletic than other Mastiff types. It takes to training easily, and socialization is important. It is known to be more unpredictably aggressive, which sets it apart from the mild-mannered Boerboel. This large Molosser dog is the symbol of Gran Canaria Island, also known as the Canary Mastiff. Used as a catch dog to work with cattle, it’s quite muscular with a broadhead that houses some scary-strong jaws. They can weigh up to 160 lbs (73 kg). This breed sports a striking fawn or brindle coat that is low-shedding. 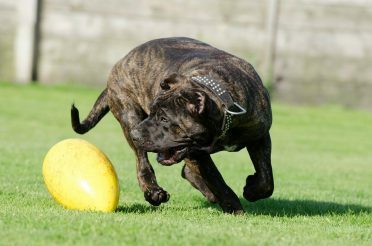 Since the Presa Canario displays guard dog tendencies, it can be aggressive towards other dogs or strangers. This, of course, makes it a bit more weary to have around children as compared to the kid-loving Boerboel. The key to obedience is by training, of course, which should be administered when it is a puppy. The infamous Rottweiler is on the smaller side compared to the Boerboel, weighing up to 110–132 lbs (60 kg). These are great herding dogs that can also be used for search and rescue. Its prowess as one of the most coveted guard dogs is world-renowned, and they are highly intelligent in their pursuits. During Roman times, this star-studded pooch was used to herd cattle as soldiers conquested across Europe. This makes the Rottweiler one of the oldest herding dogs. Stocky and short with a muscular build and distinctive black and mahogany markings, the Rottweiler is good-natured, devoted and obedient with training. It can be aggressive, especially when used as a guard dog, but if you stick to training and socialization, its temperament is easy. The difference between the Rottweiler and Boerboel is how they are used for work. 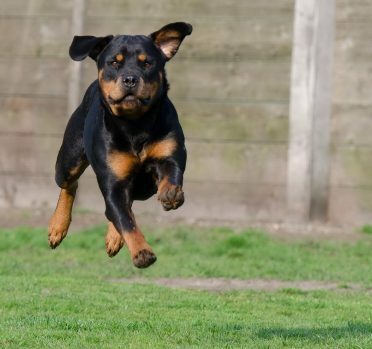 The Rottweiler is a well-rounded guardian whether it’s needed in the city or indoors. 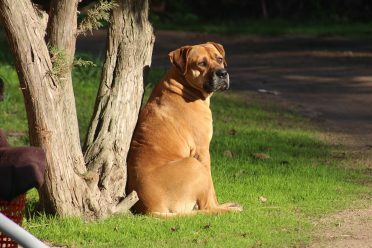 The Boerboel is a farm dog, well-adapted to the outdoors and protecting livestock. Strong is this beautiful breed’s middle name. Tall and rippling with muscles from top to bottom, the Boerboel is used to being put to work, and it takes its work seriously. It’s got a history that dates back to a time when settlers in South Africa needed man’s best friend to help protect and guard against some of the world’s greatest animal predators. The Boerboel proved it was up for the challenge, a farm dog that made sure livestock was kept sound and homestead families safe. The Boerboel makes an excellent family dog. Even though it is protective and can come across as intimidating, it’s got a heart of gold. This dog does well with children and has a ton of love to add to any happy home environment. Just be sure to give this large breed the training it needs as a puppy to develop into a well-mannered and good-natured adult. Socialization is also necessary so it knows how to behave around other dogs. Overall, this isn’t the best choice for a first-time dog owner because it demands devotion and special conditions to accommodate its size. A house with a fenced-in yard offers plenty of space for this agile breed to get the exercise it needs, or else it can become destructive if not stimulated. The devotion it needs is to help direct those guard dog tendencies, as it naturally asserts dominance. The owner needs to be confident and firm, yet never harsh. What do you think about the mighty Boerboel? Tell us in the comments!